If your round wooden bar stool seat is uncomfortable, you can cover it with a simple cushion to make sitting on it more pleasant. This bar stool cover can be stuffed with fiberfill or foam and takes little time to make. An advantage of making the cover yourself is being able to match fabric colors to your current room décor. 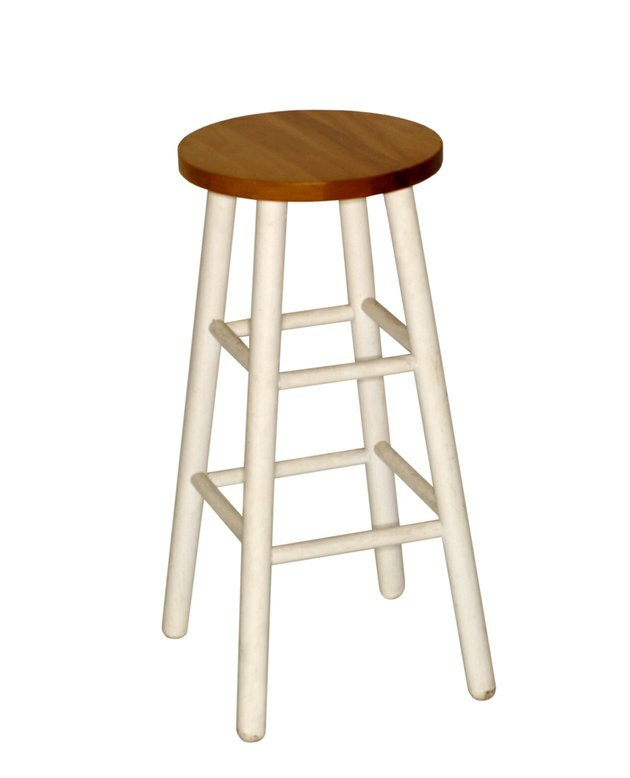 A wooden bar stool seat can be hard to sit on. Measure the circumference of your bar stool. Write this measurement down. Lay the fabric, right side down, on a flat surface. Place your bar stool, seat down, on the fabric. Draw a circle around the bar stool seat, 1/2 inch away from the edge of the bar stool. Remove the bar stool. Cut the fabric. Lay this circle on the fabric. Cut a second circle. Cut a rectangle 4 inches wide by the circumference measurement of your bar stool, adding 1 inch. Stitch the short ends of the rectangle together with a ½ inch seam allowance. Press the seam open. Fold one edge of the bar stool covers side up 1 inch. Tuck this edge under by ¼ inch to make a drawstring or elastic pocket. Topstitch the pocket down, beginning and ending 1 inch away from the seam, so you leave an opening for the elastic. Pin one of the circles to the other edge of the bar stool covers side. Stitch with ½ inch seam allowance. Press the seam open. Pin the second circle 2 inches below the first circle on the inside of the bar stool cover side. This will leave a large, round space to put fiber fill or foam. Stitch the second circle in place, with a ½ inch seam allowance on the second circle, leaving a 5-inch opening for stuffing. Fill the space with fiberfill or foam. If you use foam, trace the shape of your bar stool seat onto the foam and cut with scissors or an electric bread knife. Compress the foam to squeeze it into the cushion area, and then shape the bar stool cover around the foam. Stitch the opening closed by hand or by machine. Cut a piece of elastic 6 inches shorter than the circumference of your bar stool. Attach a safety pin to one end. Run the elastic through the pocket at the bottom of the bar stool cover side. Pin the other end of the elastic to the opening to prevent the elastic from pulling through. Tie the ends of the elastic together or stitch them together. Stitch the pocket closed after you are finished.